Ask DART: Why is DART Replacing the Light Rail Tracks in Downtown Dallas? Why is DART replacing the light rail tracks in downtown Dallas? The original DART Rail starter system opened in June 1996. After more than 20 years of wear and tear, the tracks – also known as rail – are worn out. DART replaced the most-worn sections of rail in 2014. This year, the agency is replacing the rest of the rail. Will other track improvements take place? When does construction start and end, and what will impact will it have on rail service? Construction begins March 30. DART Rail in downtown Dallas will be shut down on the weekends for at least 25 consecutive weekends. DART Rail will be back in service each Monday morning at the start of service. DART plans to finish the rail replacement work on Labor Day weekend, Aug. 31-Sept. 2. Where will work on the DART Rail line be done? Track replacement will take place along Pacific Avenue and Bryan Street between Pearl/Arts District Station and West End Station. Will Union Station or Convention Center Station be affected? No, Union Station will not be affected. The track and road work will span from the rail junction outside West End Station to the rail junction outside Pearl/Arts District Station. How will customers get through downtown Dallas if there is no light rail service? Six separate DART shuttle bus routes will operate during the weekend closures to serve the affected downtown stations. Local bus routes stop at all four closed rail stations, just as the train would. Express bus routes bypass the four closed rail stations. Are these bus routes/bus bridges free to ride? No, customers will need a valid DART fare to ride these bus routes, just as they would the train or another DART bus route. Where do customers go to catch the buses to get across downtown Dallas?Customers should look for the red Rail Service Disruption bus stop signs located near each rail station. 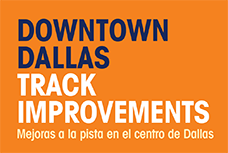 How can customers get more information about the downtown Dallas track improvements project? Sign up for rider alerts and construction alerts at DART.org/email. Call DART Customer Service at 214-979-1111. DART has several improvement projects in the works that will create a smoother, more comfortable and more efficient ride for our customers. 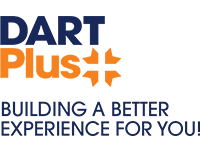 Every time you see DART Plus, you know that we are making major improvements to the DART System to build a better commute for North Texas. Learn more at DART.org/plus. This weekend promises lots of events in the performing arts category. Dance, theater and music are all happening, and they’re all DARTable. Get on a train or bus and get to these great performances. Dancing Beyond Borders brings the best performances of Dallas Black Dance Theatre’s season into one program. Artistry and technique come together in a show that’s sure to inspire awe. A highlight is choreographer Tommie-Waheed Evans’ dance interpretation of a Martin Luther King Jr. speech. This event is sold out. For those riding DART, the evening happens at the Eisemann Center in Richardson. It’s right across the plaza from the Red Line’s Galatyn Park Station. Disaster! also gets its first performance tonight. The Broadway hit is set in 1979 New York City. Aboard a floating casino and disco, a night of boogie fever takes a turn for the worse – or several. The ship succumbs to earthquakes, tidal waves, and infernos. It’s a comedic take on classic disaster movies, with a 1970s soundtrack to match. The musical comedy is presented by Uptown Players at the Kalita Humphreys Theater. Bus routes 36 and 409 depart from Cityplace/Uptown Station; both will take you the short ride to the theater. The show runs through April 7. Terri Hendrix & Lloyd Maines play Poor David’s Pub tonight. The first is a Texas songwriter who weaves folk, pop, country and blues into her own unique style. The second is a Texas music veteran who has played on 4,000 recordings. He’s also been on Austin City Limits more than anyone else ever. And we’ll throw in this did-you-know: He happens to be the father of the Dixie Chicks’ Natalie Maines. Check out the Texas duo tonight at Poor David’s Pub, just three blocks from Cedars Station on the Red and Blue line. Nick Mason’s Saucerful of Secrets brings old-school Pink Floyd music to The Pavilion at Toyota Music Factory. We mean really old-school – the Floyd drummer will concentrate on the band’s pre-Dark Side of the Moon material. The band consists of Pink Floyd touring bassist Guy Pratt, Spandau Ballet’s Gary Kemp, guitarist Lee Harris and keyboardist Dom Beken. Get to the show by taking the Orange Line to Irving Convention Center Station; the venue is a 10- or 11-minute walk. Ask DART: What is GoLink? GoLink is DART’s personalized, on-demand, curb-to-curb service, when and where you need it. You can take it to work, run errands or connect to other DART services. Where does DART offer the GoLink service? GoLink operates in the Inland Port, Kleberg and Rylie areas of southern Dallas; in the Legacy/Legacy West, Far North Plano and North Central Plano/Chase Oaks areas of Plano; and in Rowlett. Beginning March 25, the service will expand to Farmers Branch, Glenn Heights, Lake Highlands, Lakewood, North Dallas and Park Cities. How do I schedule at ride on GoLink? Download DART’s free GoPass app from the App Store or Google Play. Already have the app? Update to the latest version so you can begin booking trips. Select “Plan” within the app and enter your location and destination information. Purchase a pass within the app, if you don’t already have one. You can book your trip by calling 214-452-1827. Note: Phone reservations must be made at least 30 minutes in advance. Reservations are accepted Monday-Friday, 4 a.m.-8 p.m.
What are some tips for a smooth ride on GoLink? What are GoLink’s hours of operation? GoLink’s hours of operation vary by zone, so visit DART.org/GoLink to find the schedule information for your area. GoLink does not operate on Memorial Day, July 4, Labor Day, Thanksgiving Day, the day after Thanksgiving, Christmas Day and New Year’s Day. How much does it cost to ride GoLink? Ride GoLink at no additional cost with any valid DART fare. GoLink only offers Day Passes for sale on board. Visit DART.org/fares to learn about available pass types. How do I get more information about GoLink and GoPass? For more information about GoLink, visit DART.org/GoLink. For information about the free GoPass mobile app, visit GoPass.org. You can call DART Customer Information at 214-979-1111 to learn about both services. Cotton Belt Community Meetings are coming! Construction on the Cotton Belt Regional Rail Project is starting soon. But before work begins, we want to keep you in the loop on the latest developments to the project and give you a chance to ask any questions you might have. That’s why we’re holding a series of Cotton Belt community meetings for all interested members of the public. details of who you can reach out to if any questions or concerns arise while construction is underway. Thursday, March 28 at 6:30 p.m. If you can’t make it to one of the meetings, check out DART.org/cottonbelt to get all the details and shoot us an email at [email protected] to share your thoughts or suggestions. You can also get more information from DART Community Engagement by calling (214) 749-2543. Buses will replace trains on weekends only starting March 30 when DART begins making track improvements and replacing rail in Downtown Dallas. The weekend construction will continue into September and normal weekend service is scheduled to resume in time for the start of the State Fair of Texas. The closures will allow DART to replace track along Pacific Avenue and Bryan Street, repair and add additional rail crossovers, and repair city streets and drainage. The track improvements will create a smoother ride through downtown, eliminate ongoing maintenance issues and increase the number of areas where trains can switch tracks, which will reduce service disruptions. Rail service will be interrupted on the Red and Blue Lines between Union Station and Pearl/Arts District Station, the Green Line between Victory and Deep Ellum Stations, and the Orange Line between Victory and LBJ/Central Station, and between Victory Station and Parker Road Station. Six separate DART shuttle bus routes will operate during the weekend closures to serve the affected downtown stations. Buses will load and unload at the red “Rail Disruption” bus stop located near each station. Signs on the rail platform will point customers to these bus stops. Two Local bus routes (932, 934) will stop at every impacted station: Pearl/Arts District, St. Paul, Akard and West End. 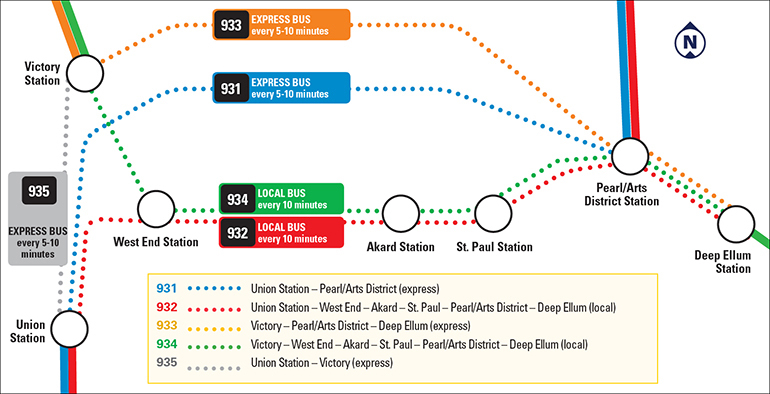 Three Express routes (931, 933, 935) will connect Pearl/Arts District Station, Union Station and Victory Station. An additional Express route (936) will connect Mockingbird Station and Bachman Station. Service and project updates will be available at DART.org/plus. Aye, laddie! Okay, we’ll stop. You’ll probably get your fill of cheesy Irish accents on Saturday, when the biggest St. Patrick’s Day parade in the Southwest takes over Greenville Avenue. If you haven’t been there, you need to do that. If you have, we’re sure you’ll be back – by DART, of course. You can get to quieter diversions on DART, too, from plays and film classics to the opening night of a much-loved opera. And if after parade day, you’re still feeling Irish (Sunday is actual St. Patrick’s Day, after all), there’s a terrific traditional performance in Richardson. Read on for some DARTable suggestions. The Quiet Man is a classic, and the city of Garland is showing it for free. This is your chance to see the Duke (that’s John Wayne) and Maureen O’Hara on the big screen. Not only is admission free, but popcorn, candy, soda and water will be only $2. The event happens at 7 p.m. at the Plaza Theatre, about a four-minute walk from Downtown Garland Station on the Blue Line. The Night of the Iguana – widely regarded as Tennessee Williams’s last great play – opens tonight in Irving, and runs through March 30. True to form for the great playwright, the play grapples with some pretty outré stuff. A defrocked priest stands accused of inappropriate relations with a teenage girl. He lives in self-imposed exile at a Mexican inn run by a dissipated old friend, where the other guests include a spinster and her grandfather and an aging poet. MainStage Irving-Las Colinas presents the play at the Dupree Theatre of the Irving Arts Center. To get there, take the Orange Line to North Lake College Station, then catch Bus Route 401. La Bohéme is about as famous as an opera gets. The Dallas Opera’s production opens tonight, with all the drama, romance and tragedy you’d expect from Puccini’s most popular work. Along with the beautiful, accessible music, there is a classic love story with a little darkness at its core. The enduring favorite runs on select dates through March 31 at the Winspear Opera House, about a 7-minute walk from Pearl/Arts District Station on all four DART Rail Lines. The 40th Dallas St. Patricks’ Day Parade & Festival is pretty much the biggest party of the year. Whether your Irish heritage goes back centuries or only exists one day a year, the annual blowout on Greenville Avenue is not to be missed. The parade travels south along Greenville from Blackwell Street to SMU Boulevard. Get to the fun by taking the Red, Blue or Orange lines to Mockingbird Station; or the Red or Orange line to Lovers Lane Station. Either puts you within a block or two of the festivities. Just look for the tens of thousands of people dressed in green, grab a beer that matches, and enjoy the 100 or so floats. DART has added service for the event, which begins at 11 a.m. While you’re there, look for Finn – DART’s own mascot for St. Paddy’s Day. Hard to say where he’ll pop up, but he’ll for sure be hard to miss. Grab picture or selfie, and post it to your social media feeds with the hashtag #DARTwithFinn. You can also check out Finn-related stories and pictures here on the blog. Phenomenal Women is an exhibition featuring local emerging female African American artists working in a variety of media. A celebration of the strength, empowerment, love and talent of the sisterhood, the art show opens today at the African American Museum in Fair Park, and runs through Aug. 10. Take the Green Line to Fair Park Station to get there. The Young Irelanders brings together some of the Irish Cultural Academy’s finest Irish traditional musical and dance performers into one spectacular group. The young players (they’re all in their 20s) are world and Irish national champions in their disciplines. This will be a fun St. Patrick’s Day Celebration for the entire family. The performance is at 3 p.m. at the Eisemann Center, just across the plaza from Galatyn Park Station on the Red Line. If you’ve been following Finn the leprechaun as he travels to DARTable celebrations of Irish-American heritage, you may think he’s just a legend. But we promise, Finn is REAL, and he’ll be walking with the DART entry in the Dallas St. Patrick’s Parade and Festival! If you happen to get a photo of this mischievous sprite, share it on your favorite social media channel with the tag #DARTwithFinn. We’ll share some of our favorites on DART’s social media. Between crowds and street closures, DART Rail is the wisest way to the Greenville Avenue parade and festival area. Take the Red and Orange lines to Lovers Lane Station, or the Red, Orange or Blue Lines to Mockingbird Station. DART has added service throughout Saturday to meet demand on a day when everyone is Irish. Download DART’s free GoPass app to buy transit passes, plan trips and get next bus or train times from the comfort of your phone. If you purchase your passes in advance, don’t activate them until Saturday morning. At the top o’ the mornin’, well 8 a.m., start the day with the annual Dash Down Greenville 5K. Dress up in your luckiest gear and join the sea of green for the best 5K and post-race party this side of the rainbow. ‘Twill be a fine morning to celebrate with beer (must be 21 or older), food, a live band, cash prizes and more fun than ever before. The run begins and ends at the Central Market at Lovers Lane and Greenville Avenue, which is right across the street from Lovers Lane Station. Packet pickup and race-day registration open at 6:30 a.m., and the 5K starts at 8 a.m. You’ll be done by 9 a.m. – plenty of time to grab a spot to watch the parade! Forty years ago, the first St. Patrick’s parade rode down Dallas’ Greenville Avenue comprised of a few trucks and flatbed trailers to entice people to visit the bars and restaurants of Lower Greenville. Today, it’s the largest St. Patrick’s parade in the Southwest with more than 90 entries. The parade steps off at Blackwell Street at 11 a.m. and travels two miles down Greenville Avenue to SMU Boulevard. Arrive a few hours ahead to get a good spot along the parade route. While you’re there, check out the Mavs Corner and the Comerica Bank Family Zone, along with other festival events from 9 a.m. to 3 p.m. taking place near Lovers Lane Station. Immediately following the parade, head to the Parade Concert for live music, located in a field at the corner of Mockingbird Lane and Greenville Avenue, an easy half-mile walk from DART’s Mockingbird Station. Forget the Irish drinking songs! Some of Dallas’ best cover bands – Poo Live Crew, Just Like Pink, The Nirvana Experience and M80s – will celebrate St. Patrick’s with 40 years of hit music. Gates open at 12 noon and the show starts at 12:30 p.m. Tickets start at $22 and are available from Prekindle. DART is always keen to hear from our customers and over the past year we’ve held a series of meetings about the D2 Subway to do just that. Starting with a stakeholder kick-off event in June, an interagency/technical meeting in July, a series of focus-area workshops in August, public meetings in September and several one-on-one discussions, we have been excited to hear all of your ideas and feedback. DART considers all of your contributions and uses them to shape the urban design vision for the D2 Subway, including station access portals. Missed the meetings or want more information? Check out DART.org/D2 for presentations and maps. Stay tuned for our next round of public meetings in April! 2019 is going to be an exciting year for the Cotton Belt with the final project design set to get started in the coming months. In addition to design, there will be a lot of activity on topics like the station Art & Design programs and neighborhood betterments. 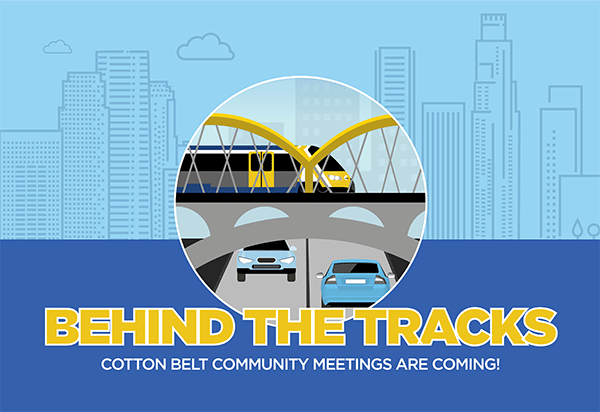 We’ll be holding a series of community meetings starting March 21 to make sure you have all the information you need as the design is finalized and before construction begins – check out DART.org/CottonBelt for details. Have you heard? DART recently signed a five-year deal with Element Markets Renewable Energy to provide renewable natural gas for DART’s fleet of 650 buses. In addition to providing clean fuel to power our buses, the deal has the potential to generate up to $11 million in revenue for DART over the life of the contract by monetizing Renewable Identification Number credits. This revenue will be put to good use as we move North Texas forward. DART is also adding 41 new buses in 2019 to expand bus service and improve schedules and frequency as part of the August 2019 service changes. We’re holding a Public Hearing on March 12 to discuss the proposed August 2019 bus service changes. Check out DART.org/meetings for details. We will be operating additional services for the St. Patrick’s Parade on Saturday, March 16. For more information, go to DART.org/SPD. Between March 30 and September, DART will be suspending weekend rail services in downtown Dallas to perform essential track improvements and rail replacements. Bus shuttles will be available. For more information, including details of which rail segments will be affected, visit: DART.org/Plus. All March long, Finn is in search of DARTable adventures as he marks Irish-American heritage month. On St. Patrick’s Day, he’s celebrating by watching The Young Irelanders concert in Richardson at the Eisemann Center for the Performing Arts. The concert takes place March 17 at 3 p.m. The Young Irelanders bring together the best parts of traditional Irish music, song and dance into one sensational concert. All of the performers featured in this festive ensemble are world and Irish national champions in their disciplines. This concert offers a chance to see and hear what Ireland’s traditions look and sound like from some of its most talented young performers. The Young Irelanders have showcased Irish culture in performances across six continents and at internationally-acclaimed venues such as the U.S. Capitol Building, the Kennedy Center, the Sydney Opera House and many more. Don’t miss this opportunity to experience true Irish culture with Finn. Of course, the best way to get to The Young Irelanders concert is on DART! Just ride the Red or Orange Line to Galatyn Park Station. One more thing — join Finn at the Dallas St. Patrick’s Parade and Festival on March 16. Once you see Finn, grab a pic or take a selfie with him. Post your photos to your favorite social network with the hashtag #DARTwithFinn. Happy St. Patrick’s Day from DART! Ready for the 70s? We’re not talking bellbottoms and disco – we’re talking Fahrenheit. It’s true: After a three-day streak of near-record breaking lows, this weekend is packin’ some springtime weather. Perfect timing for a three-day Irish extravaganza in Fair Park. There are some great indoor performances going on, too. Leave the driving to us and take DART to these happenings. You can even wear bellbottoms if you want. We won’t judge. Much. Courtyard Texas Music Series ramps up for the season with the authentic country stylings of Pam Tillis. Described as “country music royalty” (she’s Mel Tillis’ daughter), Tillis has plied the path of tradition while adding modern elements along the way. She’s the perfect choice to kick off the free concert series at Plano’s Courtyard Theater, across Haggard Park from Downtown Plano Station on the Red Line. Look for more in the upcoming months – the concerts take place every first Thursday. North Texas Irish Festival has it all: You’ve got live music, dancing, storytelling, chef demonstrations and lots more. This is one of the largest Irish festivals in the country; the family-friendly celebration of all things Irish and Celtic takes place in Fair Park over three days. Learn how to herd sheep, enjoy some Irish beer or whiskey, and talk in that adorable fake Irish accent you do. It seems fitting that the best way there is to take the Green Line. Get off at Fair Park or MLK, Jr. stations. The festival runs all weekend long. Celtic Nights: Oceans of Hope keeps the theme going. Irish history comes vividly to life through music and dance. Not just Irish history – the histories of America, Australia, Canada and New Zealand come into play, too, since they’re also part of the Irish story. After all, the Irish emigrated in droves to these places, crossing oceans to pursue a new life of hope. Celebrate Irish heritage by attending the event at the Irving Arts Center. To get there, catch bus route 401 from North Lake College Station on the Orange Line. Showtime is 7:30 p.m.
Get Happy: Angela Ingersoll Sings Judy Garland is a celebration of the American icon performed by an Emmy-nominated actress and songstress. Ingersoll captures the emotional intensity and vocal power of Garland at her best. Backed by a six-piece band, she performs at the Eisemann Center for one night only. Get there by taking the Red or Orange line to Galatyn Park Station. Manon Lescaut is one of Puccini’s earliest works, telling the tale of a popular party girl in Paris. Too glamorous for the convent life that awaits her, she meets a romantic chevalier (knight) who sweeps her off her feet. But! Another suitor appears and, let’s face it, he’s rich. What’s a Parisian party girl to do? Well, it’s an Italian opera, so you can bet that things get pretty dramatic. The lushly scored performance is at the Winspear Opera House, about a six-minute walk from St. Paul Station on all four DART Rail lines. Tonight is the opera’s last performance. Guadalupe in the Guest Room brings more melodrama to your weekend – in the form of telenovelas, which the title character adores. They help her forget her grief over her daughter’s death while she lives in her son-in-law’s guest room. Separated by a language barrier, the housemates bond in the most unexpected of ways, and come to an understanding that transcends words. The funny, heartfelt story of the healing power of telenovelas is playing at Addison’s WaterTower Theatre. It’s a short walk from Addison Transit Center, served by numerous bus routes. The play is running through March 17. Rainbow Vomit rides again – the fun art installation reopens this weekend. It’s a totally immersive environment full of vibrant colors that seem to have been “vomited” straight from the pages of a comic book. And sure enough, there are superheroes, along with unicorns and lots of other indescribable and touchable elements. The one-of-a-kind art experience takes place in a 2,600-square foot space in Exposition Park – at 3609 Parry, right across the street from Fair Park Station on the Green Line. It will be there until April 4.